Wee Lassie - 10'6" 10' 6"
Wee Lassie - 12'6" 12' 6"
Jensen V1-A Mens 18' 6"
Jensen V1-A Mixer 18' 6"
Among the many tales of the maiden We-no-nah, none is more tragic than the legend of her futile leap from a precipice now called Maiden Rock to escape betrothal to the young Chief Tamdoka when she desired the Frenchman, DuLuth. Following a sojourn with We-no-nah's tribe aside vast Lake Pepin, DuLuth resumed his mission, seeking the source of the Mississippi. She offered to guide the party of canoeists, but he declined, promising to return for her after completing the dangerous journey. But to seize her beauty for himself in DuLuth's absence, Tamdoka methodically deceived We-no-nah's tribe, convincing all but she that DuLuth had died enroute. It was at sunset on the eve of her enforced wedding to Tamdoka that We-no-nah scaled the peak alone seeking signs of DuLuth. Seeing none, and with all hope vanished, she elected death rather than life with any save DuLuth. Yet moments later it was DuLuth who found her lifeless form as he returned in triumph to claim We-no-nah. 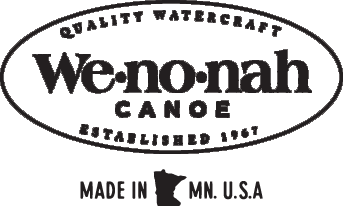 Three centuries later and a few leagues downstream, Winona, Minnesota is named for the maiden and is the home of Wenonah Canoe. The site was well known to Indians and voyageurs by 1650 but was not chronicled until 1805 when, from a vantage high atop the bluffs, Zebulon Pike described the panorama as "...most sublime and beautiful prospect." 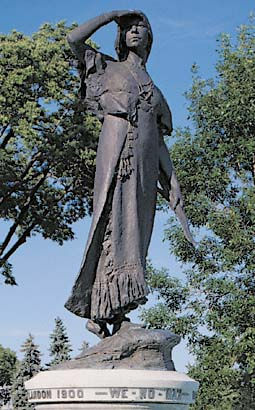 Photo: Centuries later, Wenonah (whose name means "first-born daughter") still awaits DuLuth, but now from a park in the city instead of high atop Maiden Rock. "On the right," Pike expounded, "we saw the mountains we had passed in the morning, with the prairie in the rear like distant clouds. 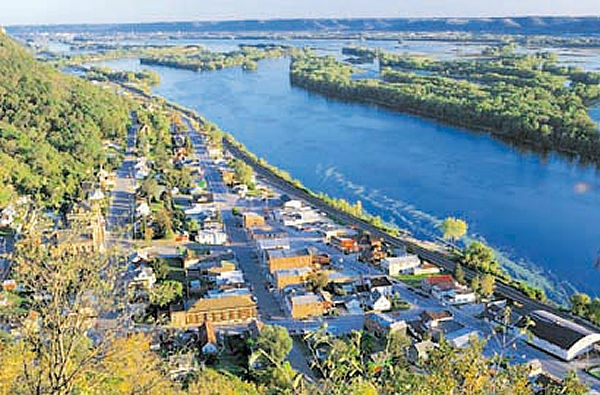 On the left and at our feet was the valley through which the Mississippi wound itself by numerous channels, forming beautiful islands as far as the eye could embrace the scene. It was a prospect altogether so variegated and romantic that a man may scarcely expect to enjoy such but twice or thrice in the course of his life." Now, as when Pike viewed it, millions of gallons of water each minute course mightily through this expansive valley. Here, far north, the Mississippi sparkles with the flood of bright snow on dense forests that reach to Canada. The water flows in harmony with the land yet is a paradox within itself. At once it goes with measured determination in deep channels. Or it languishes in still bays and lakes. Or it surges seaward through convoluted chutes. In the eras of Pike and DuLuth, a canoe was the only means to travel this land. Today, a canoe is still required to explore the intricate detail of the scene. This is the environment that spawned Wenonah Canoes and their raison d'etre. They are superlative craft created to conquer the great vastness and diversity of The River. In honor of We-no-nah who perished for devotion to DuLuth, the canoes that bear her storied name must be equal to the incredible voyage that he mastered.